As an undergraduate, I found a mentor who worked at NASA in the field of materials engineering. I was able to observe his work and started to think about it as profession and then pursued it. During my first year of graduate school at Cleveland State, I was assigned an advisor. My advisor ended up being a physical chemist, which was a field I was already interested in. From there, it was up to me to figure out which specialized field I wanted to pursue. I got an amazing opportunity from NASA, which was a full-time job offer while in graduate school. I finished my MS and accepted the job offer. It took longer than my original goal to finish my PhD. I've been blessed. Working hard, being open to opportunities & challenges allowed for more choices. 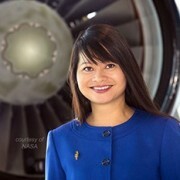 I help NASA accomplish goals by addressing technical challenges, building teams & solving problems. A great day starts with me meeting with my team in their lab facilities and being lucky enough to witness a test, and perhaps even setting it up. I'll get the opportunity to watch in real-time and see what we’ve worked on developing for weeks, months, and sometimes years, all come together right in front of our eyes. When we see results like that, we're all cheering and smiling, and I get to sit back and feel thankful that I was able to be a part of it all. My technical background has helped me in the past few years make the transition over to project management. What I've learned is that communication is key. I always wanted to break the stereotype of the quiet, nerdy scientist, so I like to get out there and let my team hear my voice as a team coordinator and as their advocate. Communication skills are essential in my line of work. Learning to pause, breathe and exercise patience while meeting deadlines are necessary to thrive in this discipline. Talk to people working in this field. Be the feet on the ground. Get an internship, shadow an engineer, volunteer and certainly never stop being curious. I'd also recommend joining organizations. I joined a National Honor Society for Women in Chemistry - Iota Sigma Pi. This non-profit organization helps women (professionals and students); promote/mentor chemistry-related careers and education. "Go back to your own country. You're stupid. You don't have to be smart to be successful." As an immigrant and non-English-speaking child, I remember looking around and hearing all of these people with perfect American-English accents. I wanted to fit in, so I developed the goal of learning how to speak English perfectly as well. I can't believe I had that goal at age eight, but I put everything I had into reaching it...and I did! One goal at a time. Sometimes you have to remove yourself from noise that is toxic, sometimes you can also overcome noise through hard work. I immigrated to the U.S. when I was seven years old. I came to this country with out knowing how to speak English, so I spent 3 years in summer school, and started out in remedial reading. But I made it my goal to speak perfect English, and by the time I was in high school, I was in AP English. First in my family with a Ph.D. Although, my dad did beat me by getting his master's in mathematics before I finished my master's in chemistry.